HotSpot software lets you manage your WiFi and redirect guests to login in different ways: with an account, social network, authenticate through PMS room/name, get free or pay for Internet access. Easily collect data, make surveys and automatically send promo emails to engage users and sell more. When guests connect to WiFi, your branded login page will appear on their smartphone, tablet or laptop. Guest may choose preferred connection method, like free access with provided keyword, access-code login, social network login and start using WiFi. Our system takes care to ensure excellent WiFi experience for all your guests, by limiting download and upload speed, bandwidth data, daily time on each connected device. 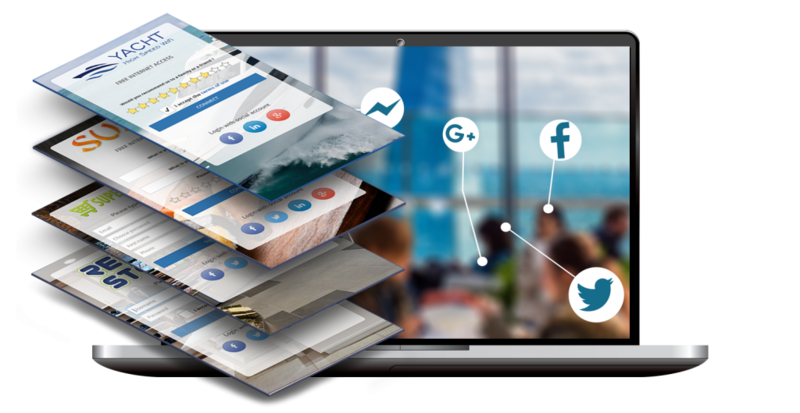 Your splash page can be configured in different ways – to show video advertisements, collect email and customer data, social login, to offer free Internet, or even high-speed paid access. Every connection will be recorded and data provided in extensive analytics for better guest understanding and marketing activities. Once logged-in, guest may be redirected to view desired website – like your special offer or venue website. GDPR will strengthen and unify data protection for individuals within the European Union (EU), whilst addressing the export of personal data outside the EU. Social network login available with Facebook, Twitter, LinkedIn, Google and VK. For those that prefer Email based access, we’ve got it covered too.